Do you pour over travel blogs wondering how on earth long-term travelers afford to travel? Are they trust fund babies? Pretty much never. Did they win the lottery? Nope. Then, how? It’s very simple. To travel full-time or long-term, one must step out of the realms of ‘normal’ and become highly creative with finances. 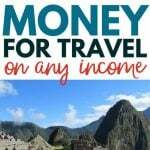 Most travel bloggers and full-time travelers are savvy money managers, able to stretch a dime as if their life depended on it. For that reason, I reached out to some travel blogging friends to find out their absolute best money-saving tip for travel. Below you’ll find tips for saving on accommodation, flights, pre-travel essentials and food. Want more tips for saving money to travel? Have a read of how to save money for travel here, and how we budget for travel here. Happy saving! Join Ebates before you travel and get cash back on travel gear plus hotel and trip bookings. Ebates has arrangements with Expedia, Hotels.com, Booking.com and Hotwire. You can also use Ebates for travel gear purchases through brands like LL Bean, Dicks Sporting Goods and more. Plus you’ll get $10 FREE once you make a qualifying purchase over $25. Join Ebates now or read more about how to save money on travel with cash back sites here. Using Priceline Express Deals can save up to 25% on each night booked and sometimes up to 60%. Express Deals are mystery hotels where you don’t know where you’re staying until after you’ve paid but with a bit of simple detective work, outlined in this post, you can quickly work out what hotel you’ll get before you book. OK, so this tip requires a fair bit of self-control but done right, you can use credit card balance transfers to stretch your travel budget in the planning stage. It’s a smart technique as many travel expenses (flights, travel insurance, hotel bookings etc) are front-loaded. Read more about how to hack a credit card balance transfer and pay less for your travel here. One thing I really miss when I’m away from home is being able to drink clean tap water. We spend a lot of money on bottled water when we are in Mexico plus the environmental cost is huge, so I’m excited to learn about this tip to avoid buying bottled water when traveling. Preparing your own food is a great way to save money when traveling. Bringing some key items with you when you travel (like a cooler bag, breadboard, and knife) means you can always make your own lunch and bring leftovers with you. Smart! Read more tips for saving money on food when traveling here. If you have a flexible schedule and aren’t picky on location, house sitting can be a great way to travel the world and stay for free! We plan to do this when the kids are older, although some families manage to house sit with kids too! Find out more about house sitting here. Another great way to keep accommodation costs down is taking part in a work exchange. All types of work experience are needed from marketing and administration to labouring and skilled tradespeople. Go here for more info on how to work for your accommodation. It’s always smart to travel with enough cash to get you started in a new country. If you are taking USD, be sure to get high denomination notes as these often get a better FX rate and are less likely to be rejected by FX vendors, says Melanie from Passport Amigo. Ever wondered how master travelers fit in so many countries? By taking advantage of airline stopover policy. Read more about how to fit more destinations into the same vacation here. Did you know that many hotels and airlines quote you a higher price for exactly the same offering if you’ve searched their website previously? Sneaky, huh? It’s called dynamic pricing and chances are, it’s happened to you. I know it’s happened to me. Read about how to avoid falling victim to dynamic pricing here. Traveling on a budget doesn’t have to mean surviving on ramen and staying in cockroach-infested backpacker hostels. It’s totally possible to stay in a luxury hotel on a backpackers budget, or even stay for free in return for looking after homes or as part of a labour exchange. With a bit of savvy and some outside-the-box thinking, you can stretch your travel budget further and have a great time for little money. Do you travel on a budget? Got a tip to share? Let me know in the comments.